The modeling system consists of two main parts: 1) a semi-empirical near-Sun module that approximates the outflow at the base of the solar wind; and 2) a sophisticated 3-D magnetohydrodynamic numerical model that simulates the resulting flow evolution out to Earth. The former module is driven by observations of the solar surface magnetic field, as taken over a solar rotation and composited into a synoptic map; this input is used to drive a parameterized near-Sun expansion of the solar corona, which is subsequently input into the second, interplanetary module to compute the quasi-steady (ambient) solar wind outflow. 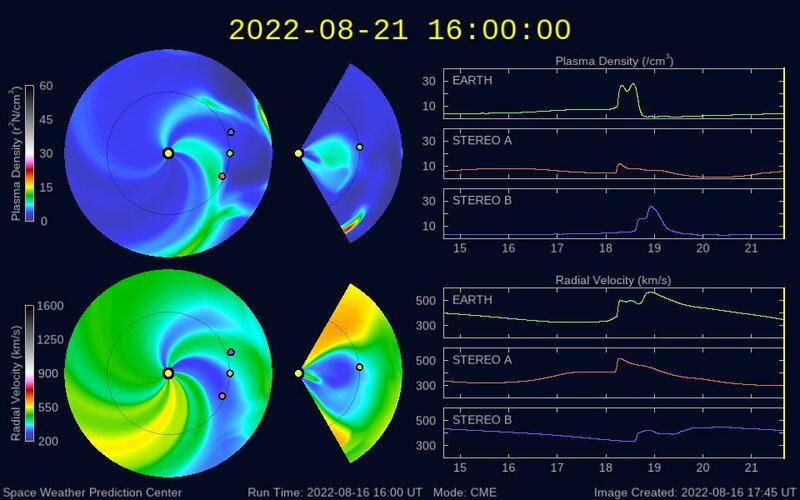 Finally, when an Earth-directed CME is detected, coronagraph images from NASA spacecraft are used to characterize the basic properties of the CME, including timing, location, direction, and speed. This input (the “cone” model) is injected into the pre-existing ambient conditions, and the subsequent transient evolution forms the basis for the prediction of the CME arrival time at Earth, its intensity, and its duration. In the movie, the Sun is represented as a yellow dot, the Earth by a green dot, and the STEREO spacecraft by the red and blue dots. The top row represents the WSA-Enlil predicted solar wind density and the bottom row the predicted solar wind velocity. On the left is a pinwheel plot of the ecliptic plane, showing all of the solar wind structures that are likely to encounter Earth or which have recently encountered Earth, in what is effectively an 'overhead' view. While the STEREO spacecraft are shown, this ecliptic slice does not normally pass through these satellites, though it is typically fairly close. In the middle are meridional slices that go through the Earth, showing the solar wind structures that will encounter Earth from a 'side' view. On the right, the predicted density and velocity values for the location of Earth and the two STEREO spacecraft are plotted. The WSA-Enlil archive is available through the National Centers for Environmental Information.